There are a number of different ways to attenuate the sound waves propagating down a duct (eg air intake, exhaust system) and I thought it would be good to list these different elements, how they work and their effect on the sound waves. Absorption within ducts is used to break up standing waves and attenuate high frequency noise such as flow generated noise. The downside is the material can break up and then expelled from an exhaust system. The expansion chamber can be considered as a simple low pass filter. The transmission loss performance is determined by the cross-sectional area ratio between the inlet and outlet ducts and the volume. With the single expansion chamber the transmission loss falls to zero when a half wavelength or multiple thereof equates to the length of the chamber. It is effectively a mass on a spring (single degree of freedom system). The large volume is the spring and the volume of air in the neck is the mass. This system has a resonant frequency and so is good at attenuating a narrow band frequency or looking at it the other way a problem that occurs at a single engine speed. 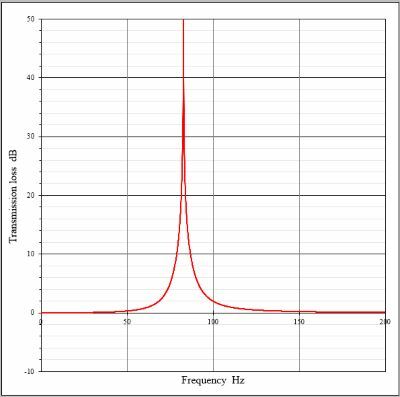 The graph shows a resonator tuned to reach maximum attenuation at 85Hz. Common on automotive air intake systems these are a fabric woven around a metal spiral and result in a flexible duct with the porosity set by the porosity of the weave. This type of duct can attenuate high frequency noises such as turbo whistles, but can also break up standing waves in the ducts. The acoustic element consists of a pipe that branches off the main pipe and that is closed at the end. Works over a narrow frequency range, i.e. used to attenuate a specific frequency. 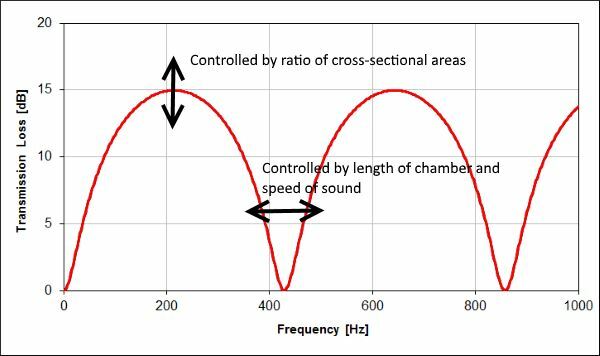 The frequency at which the quarter wave tube attenuates is controlled by the length of the quarter wave tube. The maximum attenuation is achieved when the cross-section of the quarter wave tube matches that of the main duct. The quarter wave tube, as per the title, a quarter of a wavelength long. The total distance that the acoustic wave travels is half a wavelength. 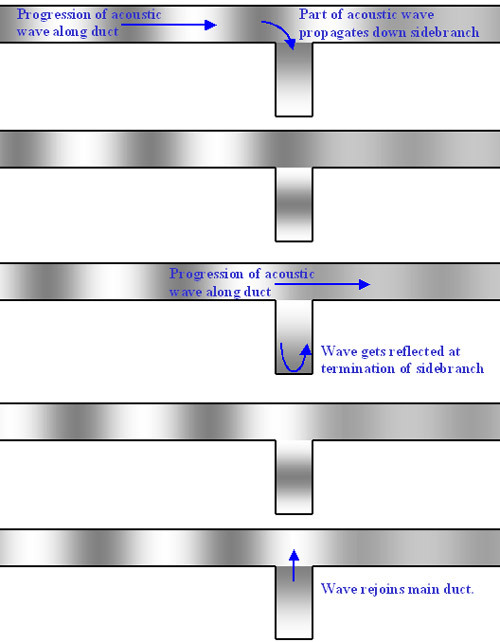 Therefore, in the time taken for the acoustic wave to travel down the quarter wave tube and back to the main duct the acoustic wave in the main duct has moved along half a wavelength. The following diagram shows the operation of the quarter wave tube. The side branch orifice is an acoustic filter element and behaves as a high pass filter. This consists of a hole in the pipe and hence more suitable to air intake systems than exhaust systems.